Offering the right roof system can help your commercial roofing customers keep their properties safe from wind and water damage. One increasingly popular choice for insulating a commercial roof is Spray Polyurethane Foam (SPF) insulation roofing and coating. SPF insulation delivers extraordinary protection properties and appealing insulating qualities, giving building owners the opportunity to reap financial benefits from reduced utility costs. Should I Buy Used Commercial Roofing Equipment? What Type of Coating Should You Use in Commercial Roofing? Traditionally, commercial roofers used acrylic roof coatings, a water-based, cost-effective solution for a variety of roofs. They are ideal in most climates and provide decent value. However, acrylics can lose thickness due to weathering and require a 50°F or above temperature for proper application. Also, they do not perform well in ponding-water situations. Other commercial roofers opt for silicone roof coatings. Silicones are “moisture cured,” and humidity helps with the curing process. While silicones can weather well since they do not get hard or brittle, they can lose reflectivity over time. Silicone is also tricky to adhere to, so if a roof needs re-coating, you either must remove the original coating or apply a re-coat with a compatible silicone. At Intech Equipment & Supply, we highly recommend high quality SPF roof coatings. They are impact resistant and can handle traffic exceptionally well. There are two main types of SPF roof coatings: aromatic and aliphatic. While aromatic coatings are less expensive, they are not UV stable, so roofers often use them as a base coating. Alternatively, aliphatic coatings are UV stable, hold color well, and stay cleaner than other coatings. The best part about an SPF roof coating system with an aromatic base and an aliphatic top coat is that the end product is resilient, stays clean and white, and is resistant to ponding water. If you are new to the commercial SPF roofing space, it is important to understand that having the right commercial roofing tools and equipment is essential to the practice of applying spray foam. But before we recommend the tools you need in your arsenal, we suggest that you have a firm grasp of the foam roofing process itself. For starters, the SPF installation process varies from project to project depending on the features of a building’s existing roof. 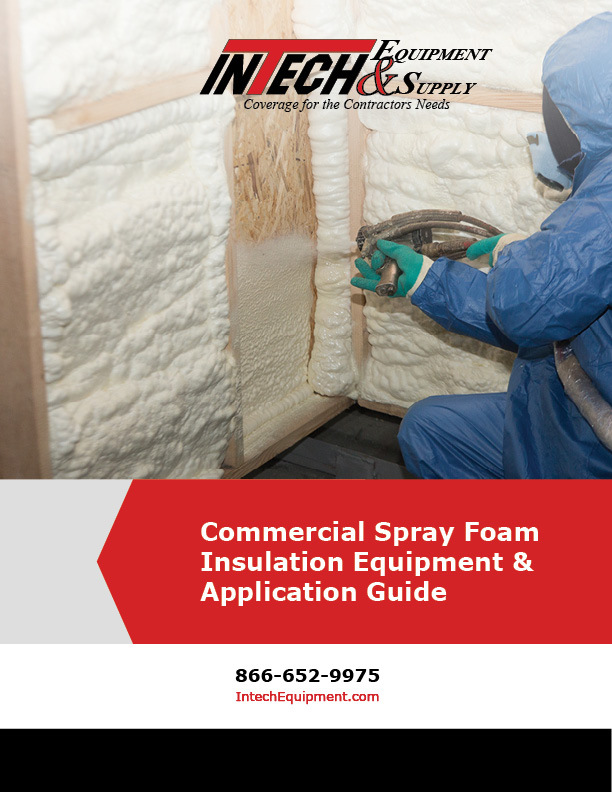 The foam insulation product originates as a liquid and rises in the form of foam in just a few seconds, and, in most cases, you can walk on it in a matter of minutes. Typically, a commercial roof application comprises of three phases: prep work, the application of SPF insulation, and finishing work. 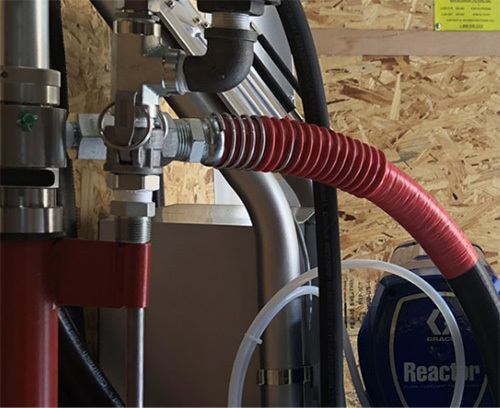 The foaming process involves transferring the roofing material’s components out of large material drums; properly heating, pressurizing, and pumping those materials via heated hoses; and, mixing and spraying the components. SPF contractors coat roofs within a project’s specifications for a particular thickness, commonly in one-inch or half-inch layers. Mobile spray rig. Spray rigs store all of the necessary tools and roofing equipment you need in one portable unit. In most cases, SPF contractors also keep their air and power utilities in their rig, along with a compressor and generator. A proportioning machine. These machines come in many shapes and sizes. 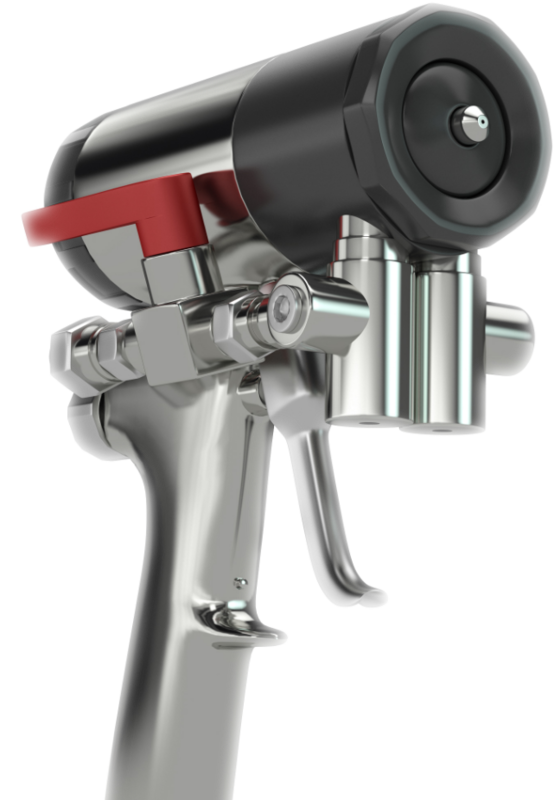 Before purchasing a proportioner, consider features, such as drive system type, output, and pressure capacity. Spray gun/heated hoses. Spray guns and heated hoses perform the most vital functions of the SPF commercial roofing application process. 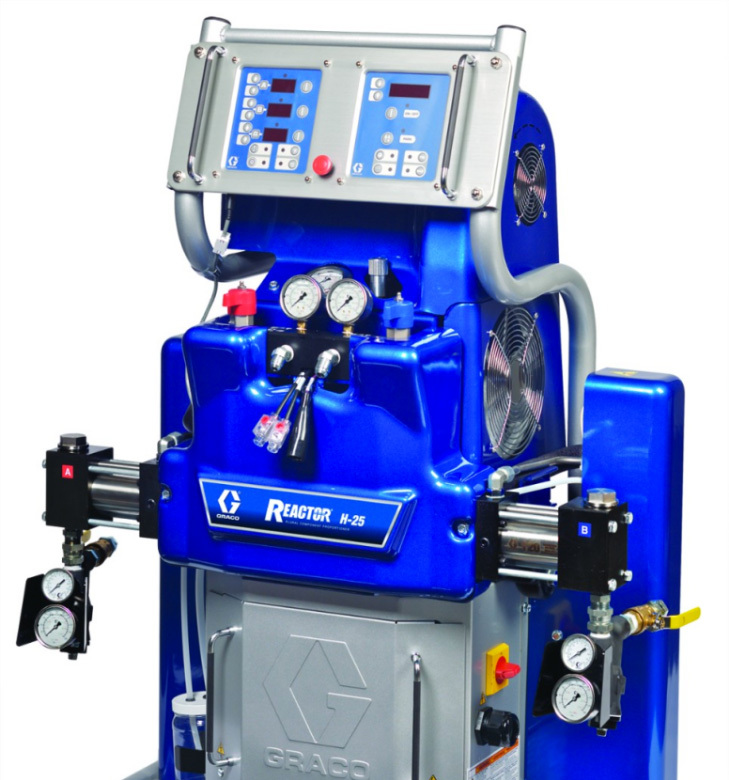 They are available in three categories: mechanical purge, air purge, and solvent purge. Auxiliary equipment. In any given SPF roofing scenario, you will likely need extra equipment and power utilities. Roofers commonly utilize various power tools to prep substrates and perform set-up, operational, and completion tasks. The market for used SPF equipment has been on an uptick over the last few years. In fact, buying used commercial roofing equipment can save a lot of money. For starters, contrary to buying new supplies, with used commercial roofing equipment, the biggest attraction is often the price tag. You can save a considerable amount of money, which, in turn, may allow you to buy even more equipment. Used commercial roofing equipment is advantageous for new or smaller businesses with a tight budget. If you have an interest in a specific type of older commercial roofing equipment, or you are hoping to augment some of the equipment you already have, buying used can be a smart choice. At Intech Equipment & Supply, manufacturers including Graco, PMC Equipment, Cleasby, Garlock, Roofmaster, RGC,, have developed working relationships with our team to foster solid customer relationships. With a complete understanding of operational aspects, along with extensive manufacturer resources, we can help you select the best commercial roofing equipment and supplies for your crew size. We also factor in your typical jobs, as well as your budget. Find everything you need to complete your commercial roofing jobs from start to finish. We offer everything from roofing tools and equipment to simple hand tools in our online store.